I haven't been able to stop thinking about a Vegas trip coming up in February. I'm gonna do it right this time! Blackjack, In n' Out, strip clubs. Okay, maybe not strip clubs. And definitely no poker games. I'm a terrible liar and I wouldn't be able to pull face in the slightest. In honor of this upcoming trip, I did another card suit mani. This one uses some amazing colors from OPI: Skull & Glossbones, Black Onyx, and An Affair in Red Square. I decided to add a matte topcoat to this, based on the inspiration I came across on Pinterest (here). Maybe when I go to Vegas there will be some bottles like that available! Clever doing this in a matte finish. I think it makes the manicure extra special. What matte topcoat do you use? I used Matte Me Crazy from NYC. I love the matte finish on this, I just bought the same topcoat. Haven't tried it out yet though. Cool design! Love that you used a matte topcoat!!!!! 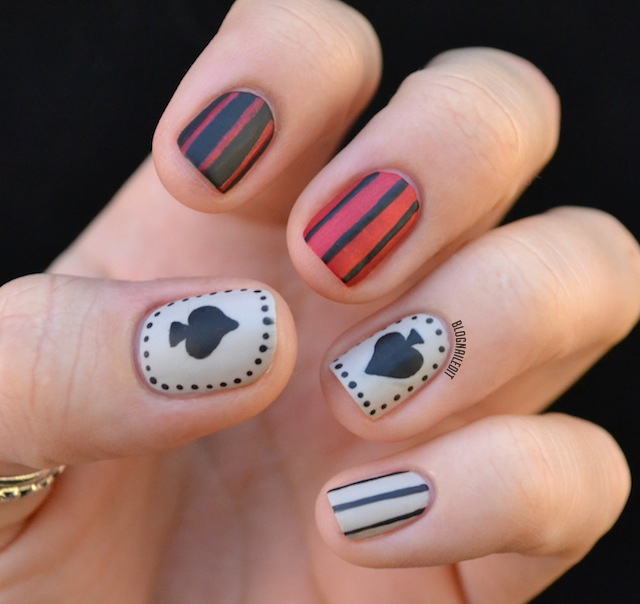 I've been dying to try poker-inspired nail art- this is great. Love that you went with a matte top coat as well. I'm currently obsessed with making everything matte. Ooooh! How very Vegas! Love it! Oooo I love this! I am seeing so many ladies rocking awesome matte manis!! I haven't told you in a while-but your manis just freakin rock dude. I am in awe and look at every post you do. These look awesome! Love the matte finish too!